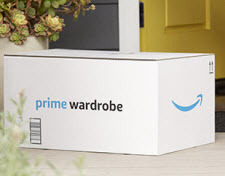 Amazon Encourages Rentals with New Prime Wardrobe? Amazon Fashion launched Prime Wardrobe, a new benefit for Prime members so they can "try before you buy." Customers select a minimum of 3 eligible items and have 7 days to return any or all items they don't wish to keep. The move will change customer expectations around the purchase of clothing and accessories the way it did when it comes to free, fast shipping. A common complaint among online sellers is that buyers feel free to return clothing with stains or tears that show they've worn the items while expecting a full refund. This sense of entitlement will probably increase as Amazon promotes the new service. Amazon does encourage shoppers to keep items: "if you decide to keep three or four items from your order, you will receive 10% off those items. If you keep five or more items, you will receive 20% off those items." Prime Wardrobe gives Amazon an edge in apparel, while posing a threat to brick-and-mortar and catalog retailers. Learn more about Prime Wardrobe on the landing page, and let us know how you think this will affect online sellers. Good ole Amazon, screw the sellers over while they get to keep the fees. I could see people wearing the item once or twice and sending it back reeking of perfume cigarettes or worse. With tears or stains, or even a different garment. Note that apparel is a closely held category on Amazon, and 3P merchants who are allowed to sell clothing may never make it into the Wardrobe program. My premise is that the new program will have a spillover effect in terms of customer expectations. Ina says "Note that apparel is a closely held category on Amazon, and 3P merchants who are allowed to sell clothing may never make it into the Wardrobe program." I certainly hope that is the case. I would not want any part of that program. Well now I know where to rent an evening gown. Amazon is getting beyond stupid. As a former seller on eBay of primarily apparel for about 8 years. I can say without a dought, This will hurt sellers if they are forced to take returns after 7 day. about 10% of my business was dealt with returns under false pretenses some wanting to return as long as 30 days after delivery saying not as described and when received , The package was not even opened yet , As well as coming back ripped or stained as stated above. Let the sellers decide weather or not they take returns. Myself I have a 24 hour after delivery. That gives them plenty of time to make sure it fits and nothing is wrong with it. One thing not mentioned is if the original hang tag or sticker must be included with the garment or accessory item to obtain the refund. I would think that the piece of clothing would have to come back unstained, undamaged, and with all tag(s) or sticker(s) intact. Amazon, it would appear, should know that a ''rental program'' is extremely unprofitable. Look at Zappos. And who would wear an item to an event with a tag hanging out just to send it back a week later (other than Minnie Pearl)?? If they require that all the goods have to be returned in the original condition, the likelihood of rentals would be non-existent, or close to it. As of right now, though, Amazon is giving the eCommerce and retail industries all of the sizzle, and not much of the steak. To clarify: The ''sizzle & steak'' comment above was only about the Prime Wardrobe program. And as Ina stated, most all third party sellers are not allowed to sell clothing on Amazon. After jewelry and medical items, it is the toughest category to get approved onto. Another interesting question: If an Asian clothing seller offers free returns with this program, does Amazon pay for the overseas return shipping?? Amazon is a master at losing money. But isn't that essentially how B&M retailers already operate? I think one can make the case that this move brings Amazon into parity with those retailers, rather than giving Amazon any advantage. people can buy price retaggers and all kinds of things. Also people are pretty inventive at hiding price tags when going out. Three key words: change, customer, expectations. Guess who will be subsidizing clothing rentals and an insane amount of returns (why not, returns are 'free')? Honest consumers. I will pass on Prime Wardrobe. Sellers have nobody to blame but themselves. They sign up and run their fastest to get to the first one in line to be ripped off. apparel is hard to sell. And it has a high return rate. I sell apparel and the reason I have 0 returns is because I include the measurements. That's something AMZ doesn't do. It just gives you the size and if it doesn't fit you return it. High return rate. Repeat high return rate. Even when I go into B&M stores and buy garments off the rack, I often return them because of changing my mind, didn't like the fit, a bunch of reasons. Ah, keep in mind that (as usual) this costs Amazon nothing. If customers return items that are damaged, they get packed up and shipped back to the manufacturer. Even better for Amazon, the manufacturer pays fees on the returns! Once again, this is absolutely BRILLIANT on the part of Amazon. They have huge, built in advantages over normal merchants (hey, I'd offer the same if I could ship these items back at manufacturer expense!). They continue to use their advantages competitvely and continue to take more and more market share as a result. I once worked at a bank, there was a woman there that had nice expensive clothes; new all the time. She would tape the bottom of the shoes, wear the tags inside the clothes, she also had a tag gun. She did this for for years until she got fired for stealing from the bank. She probably still does it now. If I knew I could get previously worn items from amazon I wouldn't buy them there. It won't affect me as a buyer because I don't buy from them now. Selling clothes however, that is a bad situation since other sellers will be expected to do it as well. ignatz says "But isn't that essentially how B&M retailers already operate?" There is actually a huge different. The buyer in a retailer actually has to bring back the damaged or smokey or stained or tags missing merchandise back into the store for the return. Under these circumstances a manager would likely become involved. And no, they will not take the merchandise back under these conditions. If you shove something in a box which is soiled, stained or smelly and ship it back to Amazon it's the buyer's word against the seller's word. It is much harder to lie or distort the truth when you have to look a clerk or manager in the eye. Retailers have clamped down on their liberal return policies. Chicago48 says " I sell apparel and the reason I have 0 returns is because I include the measurements." It's quite amazing how every one of your buyers actually reads your listing descriptions and no one has a fit problem. I have read thread after thread (for over 14 years) of clothing sellers on eBay complaining that despite the fact that they they included all definitive measurements they still get returns related to fit. Many of these of course are likely rentals since the returns come a few days before the return policy time stipulation is to end. You've must be very lucky. If you've been selling clothing for many years "0 returns" is quite unbelievable. NO, that is not how B&M retailers operate. It is much harder to buy 3 and return 2 in a B&M store as you are facing people one on one... In addition, B&M stores have the right to refuse refunds to serial refunders (I know, my ex-wife was banned from returning clothes at Macys for that exact reason). Unless Amazon allows sellers to 'ban' buyers that have given them problems (as Ebay allows), this will not work. I am just happy that I never tried selling clothes.